If on your travels you should happen upon a bag of Masa Harina then I strongly recommend that you slip at least one packet into your basket. 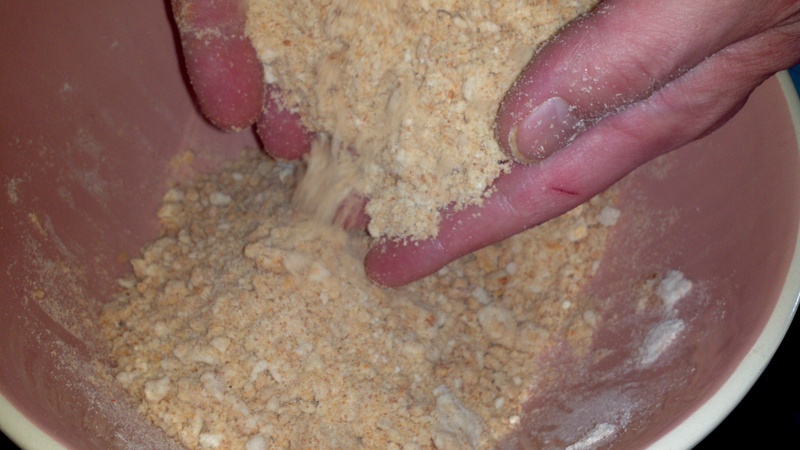 Masa Harina is flour made from corn, and as such is full of that delicious corn taste. 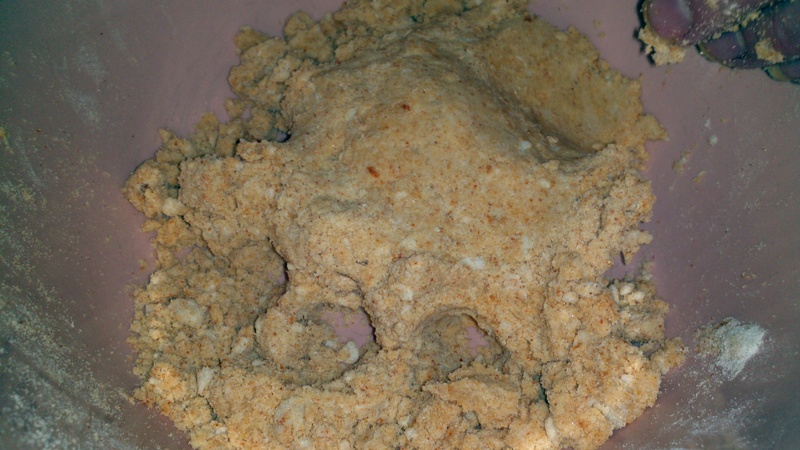 Sift the Masa Harina into a large mixing bowl, sprinkle the salt over the top and add the Olive Oil and the Paprika if using. 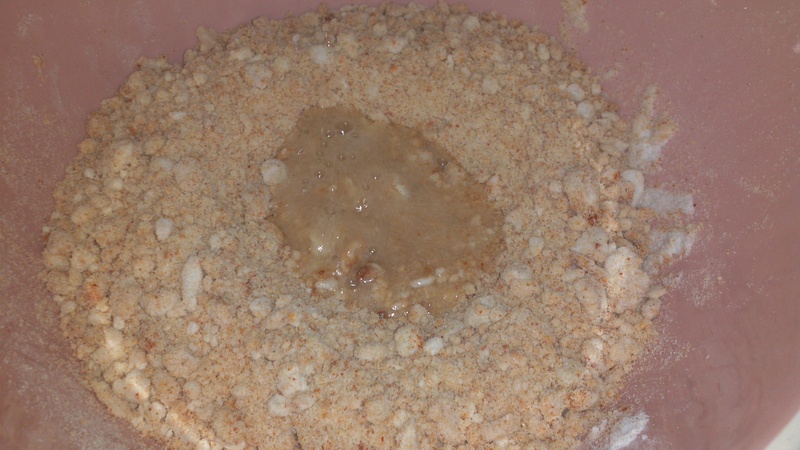 Rub the mixture with your finger tips until you have a bowl of course breadcrumbs, let it rest for 10 minutes. 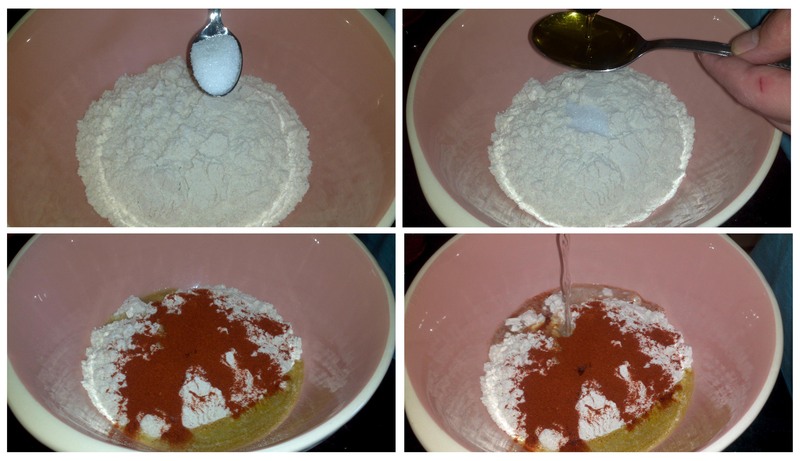 Make a well in the flour and pour in most of the water. Now the fun part, dive in and mush it up. 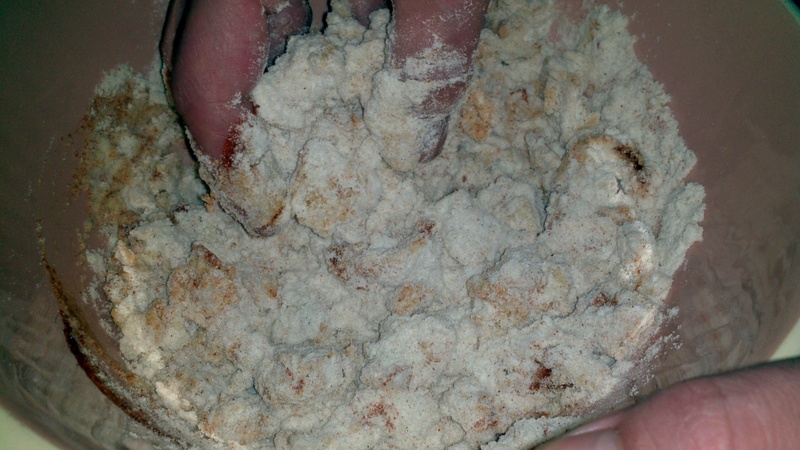 Keep grabbing the dough furthest from you in a mechanical digger style and lift it onto the top of the dough nearest you, push down with your palm. Repeat this action till you have a smooth ball of dough. 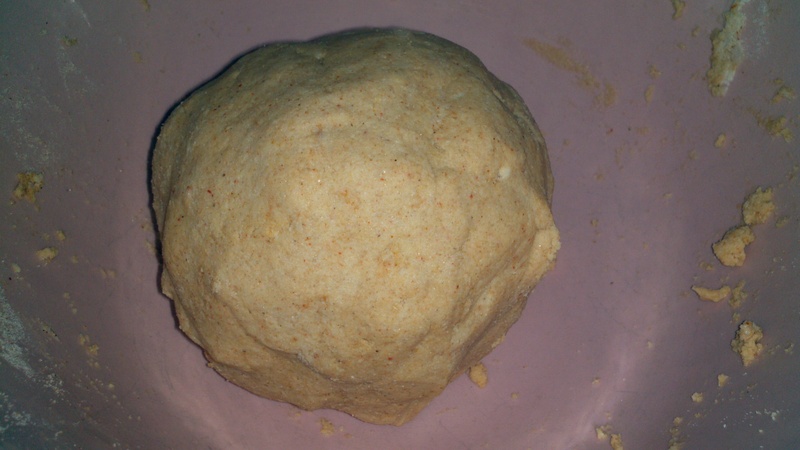 Add more water or Masa Harina if your dough is feeling too wet or dry, as required. In the end you will be done when your ball of dough is lovely and smooth, it should be sticky to the touch and if you break a piece of and squash it flat on a worktop it should stretch out without tearing. If it does tear then just add some more water to your bowl and kneed a little longer. When you are happy with your ball of dough leave it in your mixing bowl and cover with a tea towel and let it rest somewhere warm for an hour. In that hour you now need to track down two pieces of clear plastic about the size of an A4 sheet of paper, I used a zip lock freezer bag and cut it up accordingly. Put your skillet or frying pan onto a high heat to get it really nice and hot. 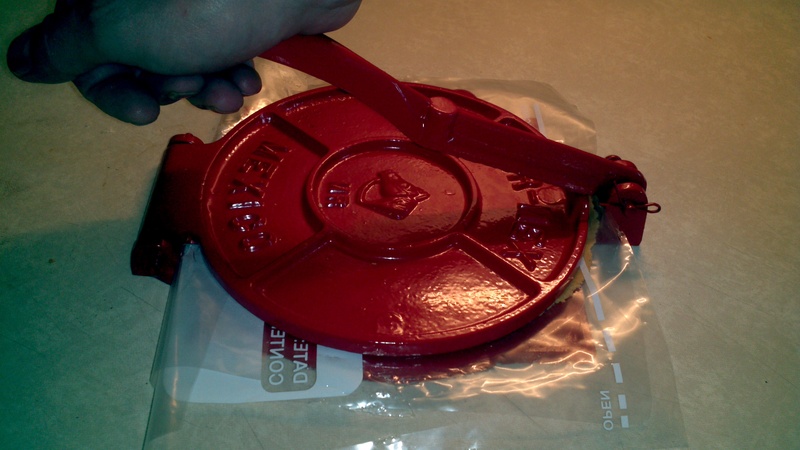 Use a cast iron one if you have it, if not the heaviest frying pan you can find. Take a piece of dough about the size of a nectarine and place it in your tortilla press (what do you mean you don’t have one…get one they’re brilliant! And cheap to buy). 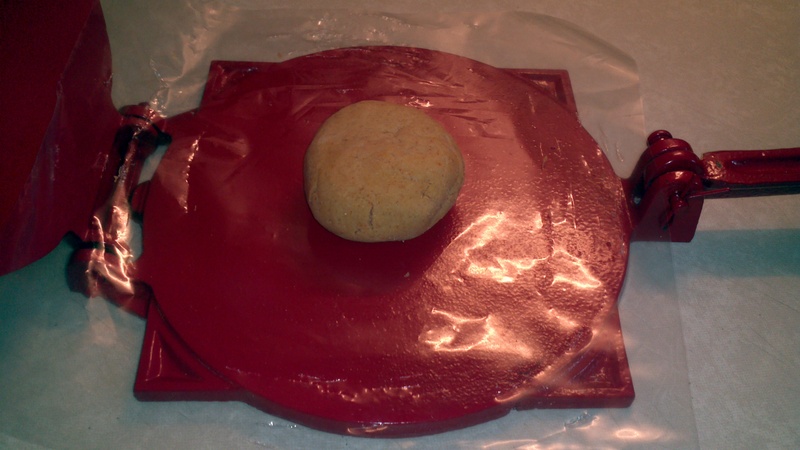 If all else fails, place one sheet of plastic on a work top, place your small ball of dough in the middle and lay the second sheet of plastic over the top. Now take something heavy like a stock pot or a thick dinner plate, don’t use the best china, and press down. 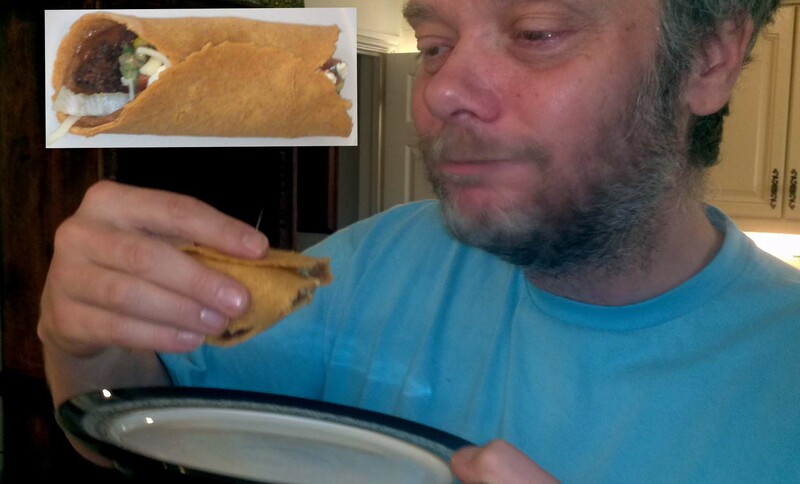 Turn the half formed tortilla over and press down again. You should have a disk about 20cm in diameter that is about as thick as a pancake. Peel one sheet of plastic of the tortilla. 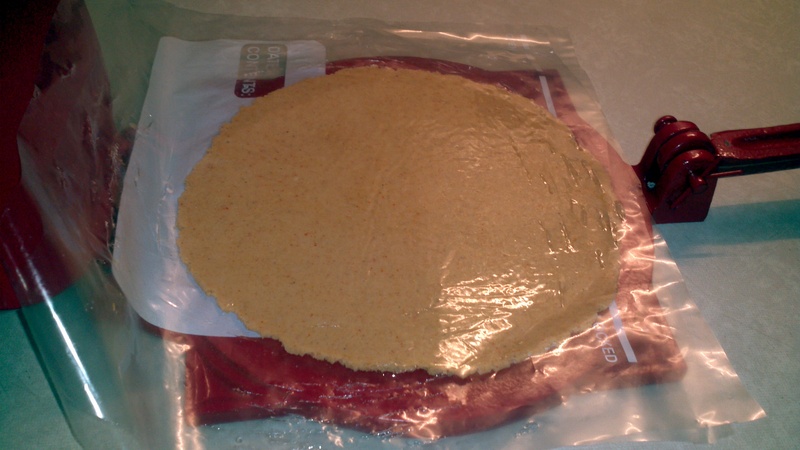 Now lay the tortilla onto your left hand and with your right hand remove gently the second sheet of plastic. In a smooth sweeping motion lay the tortilla down into the hot frying pan. After a minute you should be able to shake the frying pan and the tortilla slide about, you should also notice some bubbling of the surface. 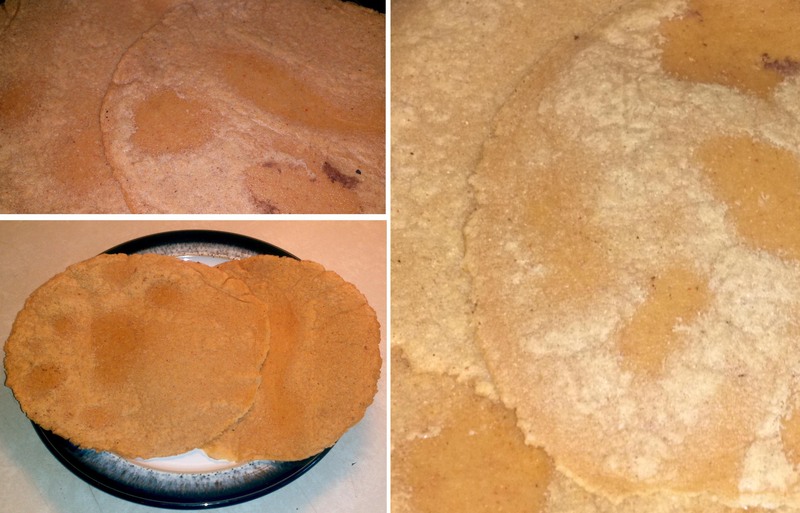 It is time to flip the tortilla over. Cook for another minute and then remove to a warm plate. Cover the tortilla with a warm damp cloth whilst you cook the rest of your dough. Fill with your heart’s desire and enjoy, just like I did. But I know… You posted it ;)))…. Final marks to you girl friend :).